Bob the Bootlegger. 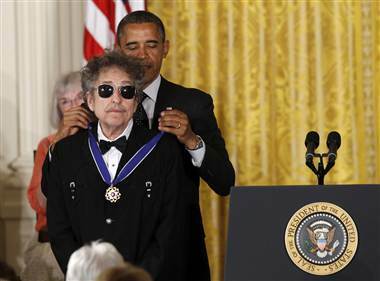 An unworthy recipient of the Medal of Freedom. This entry was posted in Media/Arts/Entertainment and tagged Bob Dylan, counter-culture, Joni Mitchell, Medal of Freedom, obama, plagiarism. Bookmark the permalink. I didn’t know that about Bob either. Disappointing to say the least. I’m feeling so naïve since learning Bobby did deceive, I had no idea about the scam. Can I pick and sing his songs, thinking all along that he and all the rest are just a sham? You think of all the people out there who have done so much for their country and for humanity. And when you see the sad corrupted shams offered up for recognition, you could just vomit. Everything the Left gets its hands on it contaminates. And yep, Mr. Zimmerman–just another media hyped fraud.